Beach Dental Center (Miami Beach) - Book Appointment Online! Founded in 1988, the Beach Dental Center is located one block north of the famous Lincoln Road in the heart of Miami Beach. We specialize in providing gentle dentistry for children, adults, and seniors. The Beach Dental Center understands the need for consistent care. We treat each patient like family. 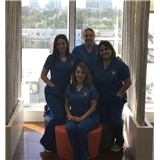 Our compassionate, professional team is dedicated to providing the highest level of dental care possible. Beach Dental Center is nothing but the best. I have lived in and traveled to many countries and time at dentist always makes me very anxious. I also react badly to needles following a very bad dental experience as a child. Having had two check-ups, two cleanings and most recently a cavity filling, I can assure you that the entire team is the most professional and friendly team I have ever met. I was so impressed today, I didn't have any anxiety and the entire procedure was over in 30 minutes! Not a common saying, but this was my 'best dental experience' and I now don't have to worry about future visits. Truly recommended for professionalism, friendly and personable team members and a very nice dental studio. Anyone who is sensitive to dentists or has anxiety will be well taken care of. Thank you Georgia, Michelle, Leilani and Zuly! You are the best! Matthew.